Over the past five years, all countries in the region, except Ukraine, have increased their overall score. 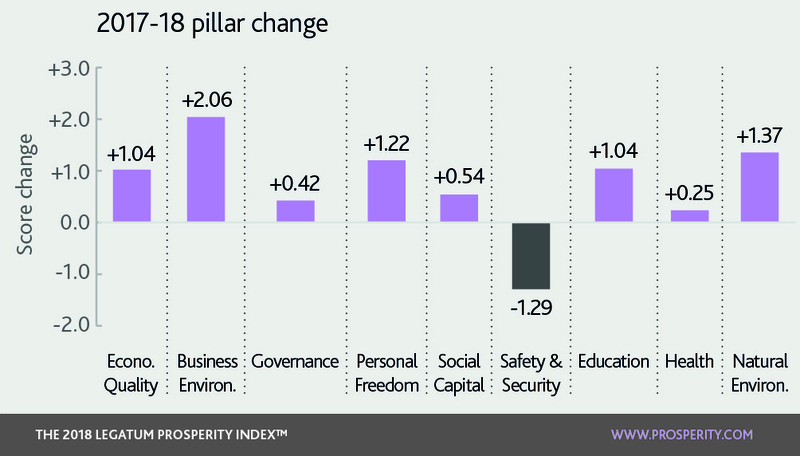 Over the past year, all but two countries (Czech Republic and Latvia) improved their prosperity. Safety and Security declined significantly this year. Russia is the main driver of the fall in scores, but there have also been significant decreases in Poland, Moldova and Croatia. In Russia and Poland, there was an increase in the political terror indicator, a measure of state sponsored violence. In nine of the countries that fell, there were also significant falls in the reported availability of food and availability of shelter. Within Business Environment, investor protections and the ease of starting a business have grown significantly. Strong growth in Business Environment over the past decade means Eastern Europe is now at almost the same score as the rest of world average for this pillar, although there are significant differences across the region. In the spotlight: where next for improvement? The “velvet divorce” between Czech Republic and Slovakia has led to two countries with similar levels of prosperity. They are ranked third and fourth in Eastern Europe and are ranked a dozen or fewer places apart in all but one of the nine pillars (Business Environment). Both have strong automobile export industries and both are each other’s second largest export destination, behind Germany for both countries. The two countries score lowly for labour market flexibility, ranked 110th and 118th in this sub-pillar. Croatia performs well generally, ranked eighth in the region, but it performs poorly in the Business Environment pillar, ranked 104th globally and positioned behind Ukraine in the region. It is perceived as a poor place to start a business, and has a high cost of doing so. Finance is hard to arrange and labour market regulations are numerous. Romania, ranked 10th in the region (and 45th globally), improved its prosperity the most in the region over the past five years, climbing 16 ranks. Gains have been made across all pillars, with the biggest improvements in the Business Environment and Social Capital pillars. In contrast to the region’s overall downward trend in Personal Freedom, Romania has risen in the past decade. Romania, and the whole region, perform particularly poorly in Health. Some of the reasons for this are high diabetes levels, high obesity and low vaccination rates. 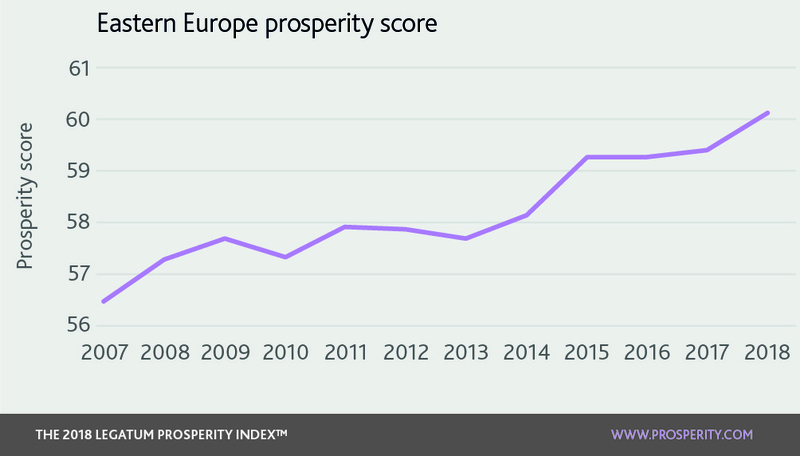 Eastern Europe as a whole has experienced greater growth in prosperity over the last decade than any other region, except for Asia-Pacific. Since 1991, GDP per capita has risen by over €10,000, an almost five-fold increase. But the drivers of prosperity vary across the region. When considering these drivers four zones emerge: the northern “entrepreneurial sea”, the central “industrial hinterlands”, the south-east “food hub” and the eastern former Commonwealth of Independent States (“former CIS”). 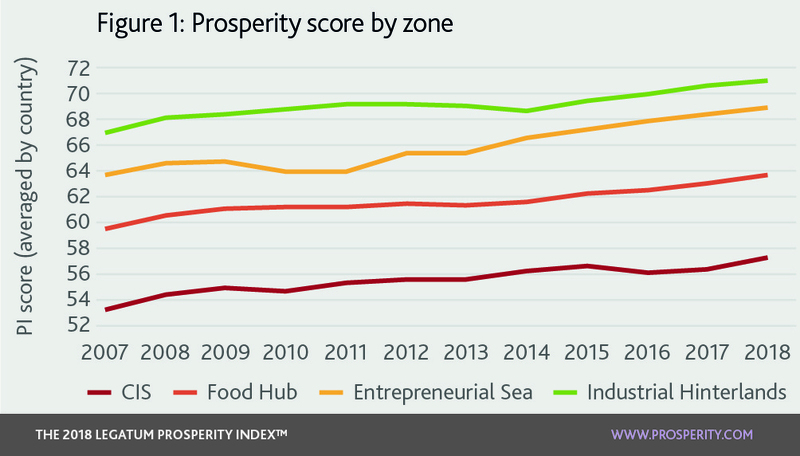 This year’s Prosperity Index shows that, for each zone, there are different journeys to prosperity, and different challenges to overcome in order to build future prosperity. The “industrial hinterlands” is the most prosperous zone within Eastern Europe, and is made up of parts of Poland, Czech Republic, Slovakia, Slovenia, and parts of Hungary. They score highly in the Economic Quality pillar and in measures of business infrastructure within the Business Environment pillar, with countries ranking globally between 22nd and 51st for the logistics performance index, and between 29th and 45th for fixed broadband subscriptions. This area forms a key part of the integrated European supply chain supporting Germany’s hub of engineering excellence, and this is one of the reasons for the zone’s success. They have a relatively highly-skilled but low-cost workforce, so firms in neighbouring countries, notably Germany and Austria, have made use of the hinterlands to lower costs and maintain competitiveness. The region has flourished economically over the last decade, primarily driven by industries around vehicle production. The region’s focus on car production over the last few decades has been a strategic move that led to swiftly-rising prosperity, but the industry faces big challenges over the coming decades and the hinterlands will need to adapt. There are two areas that could support improvement. First, improving labour market flexibility. All countries in the zone rank in the bottom 50 for hiring and firing practices in this year’s Index. Second, the entrepreneurial environment requires improvement. In all countries people have poor perceptions about the value of working hard to get ahead, and three of the four countries rank 90th or below for ease of starting a business. Creating a more entrepreneurial environment would greatly strengthen the quality of the hinterlands’ business environment. The Baltic “entrepreneurial sea”, consisting of Estonia, Latvia and Lithuania, along with certain sections of Poland, gains its name from its close proximity to the highly entrepreneurial Nordic states, but this is not all it inherits from the Baltic Sea. Partly born of geographical proximity to Finland, Denmark and Sweden, and the trade and commerce opportunities this presents, and partly resulting from the virulent rejection of Russian influence post 1991, these countries perform strongly across entrepreneurial aspects and within Eastern Europe have some of the greatest levels of prosperity. Estonia, Latvia and Lithuania rank 10th, 18th and 24th globally in the ease of starting a business. Latvia now ranks 10th for the ease of getting credit, and every country has increased its score in this indicator over the last five years. Their entrepreneurial successes, moving into new industries such as digital technologies and cyber securities, put them in good stead for future prosperity. For more on one of the region’s success stories, see our feature on Estonia. The countries of the southeastern European “food hub” are parts of Hungary, Croatia, Romania, Bulgaria, Macedonia, Serbia, Montenegro and Albania. Based in the Danube river basin, they are fortunate to have extensive fertile agricultural lands and agriculture remains a primary component of their economies. The focus on agriculture has stunted growth in the economies of these countries, which in turn has left them with poor levels of economic quality. The majority of the farms in the food hub are small and extremely inefficient; according to World Bank data over 25% of Romanian farmers are living under the $5.50 per day poverty level. The food hub also contains a number of non EU-member states who are less economically integrated and far less prosperous. There is high unemployment in most countries across the region. In Macedonia, it is highest at 23%. There is also high relative poverty. For example, in Serbia, 25.5% of people are below the national poverty line. As noted in our Central and Eastern European Prosperity Report, outward migration of skilled workers remains a significant challenge to this zone. The greater development of urban centres across the zone should be a priority, along with assessing how local industry might use their strength as a food hub to move up the value chain of food processing. The former CIS zone, made up of Russia, Georgia, Belarus, Armenia, Moldova, Azerbaijan and the Ukraine, is by far the lowest performing of the four zones. It performs worst in all pillars, with the exception of education. The primary issue within the former CIS is the significant deficit of institutional foundations. The former CIS zone, made up of Russia, Georgia, Belarus, Armenia Moldova, Azerbaijan and the Ukraine, is by far the lowest performing of the four zones. It performs worst in all pillars, with the exception of education. As a regional average, the former CIS would sit 129th in Personal Freedom, 124th in Governance, 117th in Social Capital, and 100th in Safety and Security. Governments in the region are largely totalitarian, preventing good governance and restricting important freedoms. For example, both Azerbaijan and Russia have the worst possible score for political rights, and four countries score in the bottom 50 for the World Bank’s rule of law measure. There are also severe government restrictions in practicing religion. For example, Georgia is the best performing country in this zone, but ranks just 91st globally. In addition, all countries score extremely low on measures of social tolerance. For measures of perceived tolerance towards ethnic minorities, LGBT individuals, and immigrants, the best global rank for any country in this zone is 98th. For example only 1% of Azerbaijanis believe that their society is tolerant towards LGBT people. Russia is ranked as the seventh worst country in Pew’s measurement of social hostilities toward religion.